Where did it go? January I mean! Doesn’t seem like yesterday it was the end of Christmas and we were looking forward to the new year, now we are the second month in already! Spring is really slowly coming apon us, daffodils are poking their heads up, bluebells again, just poking their green shoots out, teasing us even more. Even more so, the spring work is slowly starting to pick up momentum. Most of my fruits trees I manage are now all pruned bar a couple and I have moved on to wisterias and roses, a real sign for me that spring is just around the corner! Yes yes even us professionals get things wrong! Iris George is a beautiful little purple iris that ummm has disappeared amongst the purple and yellow pansies, yes yes I know I should of put a pale pansy underneath but I wasn’t thinking ok, but never mind, I still love these dwarf irises ! Finally after 3 wet Saturdays I have managed to finish off the tiling on the front of our children’s new playhouse! All I need to do now is fix the flooring in, add the plastic to the window and build a shelves of their toys and we shall be all done until I start doing the green alpine roof! It’s getting there! Haha fooled you all! I bet you hoped there would be no snowdrops in this one but there is and this one is called green brush and I love theses ones with green on their petals, can’t wait for this one to bulk up! My Edgeworthii is slowly opening and my tiny space is full of its beautiful scent! It’s one of my little treasures in the garden but that said they are all my little treasures really! Can’t wait until it’s all fully open. Another new dwarf iris for me, this ones called painted lady. It goes look rather stunning but did come up rather weird, rather twisted and odd, wasn’t too sure about it but now it’s fully opened I love it! It is true that it would be much more beautiful than a forsythia … too common in our gardens. I’m waiting for the next week now! 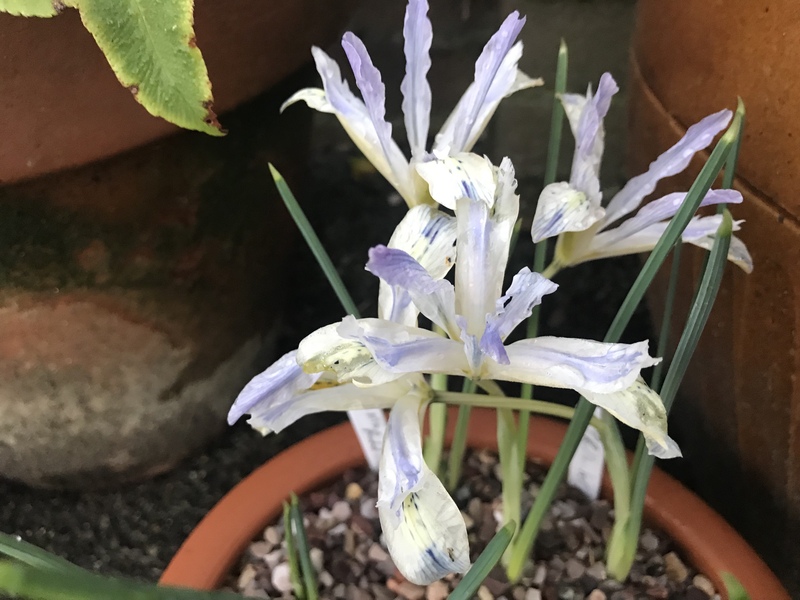 Are Iris reticulata always so early? I’m thinking I could have mixed them in with my tulips in pots to get a longer display. Love the Edgworthia too. Aw, c’mon! Planting purple iris with those purple and yellow pansies is a design gem – the purple creating the unified theme to draw out the yellow. Don’t forget that as your children get older, their toys will get bigger so you will probably need at least one shelf about the same size as a potting bench. Funnily enough, I’ve been thinking, thanks to you, of replacing a Forsythia with an Edgeworthia. According to Matthew Wilson, I have around 90,000 species and cultivars to choose from. This may take some time. Great minds John great minds!!! Another vote here for the purple & gold iris-pansy pot. I imagine planting a lighter coloured pansy would give a different & equally lovely look to the container. Maybe both next year? And one w/the tulips? Another with snowdrops. A fourth with . . . Also loving the edgeworthia. It’s one of those SOMETHING plants. The Mae West of shrubs. They are aren’t they, be careful they are also very addictive! Edgworthia and ‘Painted Lady’ Iris reticulata. . . Well, I sent nothing this week. (I do not intend to make a habit of Six on Saturday.) I should try to find something as interesting as those two for next week. I am still not so keen on the Edgworthia, but I do not think I have anything more interesting. I will look around at work. I love the spring irises too, such wonderful colours, and Painted Lady is beautiful. Unlike Tony I think the edgeworthia is very special, like everything I suppose it is “horses for courses”. Hope you are well protected for your rose pruning!